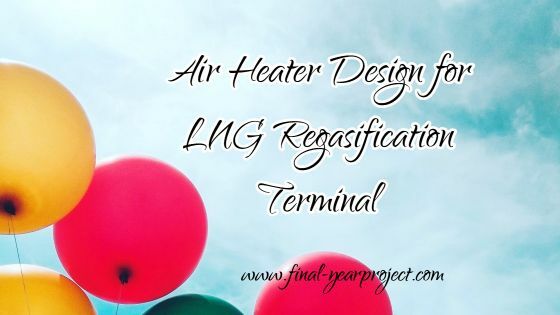 Air heater design for LNG regasification terminal is a Chemical engineering final year projects for students. Liquefied natural gas (LNG) is natural gas, primarily composed of methane, which has been converted to liquid form for ease of storage and transport. The conversion of natural gas to its liquefied form allows for the transport of greater quantities. The receiving terminal is one component of the LNG chain between the gas field and the residential or industrial consumer. You can also Subscribe to final-Yearproject.com by Email for more such projects and seminar. LNG is a clear, colorless, non-toxic liquid that can be transported and stored more easily than natural gas because it occupies up to 600 times less space. When LNG reaches its destination, it is returned to gas at regasification facilities. It is then piped to homes, businesses, and industries. A simplified process flow diagram is shown in above. 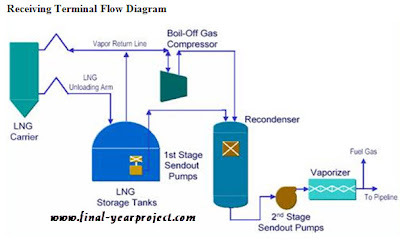 The LNG receiving terminal receives liquefied natural gas from special ships, stores the liquid in special storage tanks, vaporizes the LNG, and then delivers the natural gas into a distribution pipeline. The receiving terminal is designed to deliver a specified gas rate into a distribution pipeline and to maintain a reserve capacity of LNG. Capacity depends on expected shipping delays, seasonal differences of availability and consumption, and strategic reserve necessities (strategic reserves area unit required once the terminal could also be known as upon to exchange another massive supply of gas from either a pipeline or another receiving terminal on short notice). 1. LNG unloading system, including jetty and berth. 4. In-tank and external LNG pumps. Supporting utilities, piping, valves, control systems, and safety systems required for terminals' safe operation. Air heaters are used to heat air with forced convection, radiant heat, or resistive heating elements. Forced convection moves air past a heat source with a fan or blower. Radiant heaters radiate heat from coils that contain heated, circulated media such as oil, hot water, waste oil, or steam. Use this report for your reference and study only. Note: Don't forget to subscribe to our newsletter to get free updates about latest projects.